By the time the Great War began in 1914, Whatcote Cottages in Platt were ten years old, and over the course of the next four years, could comfortably claim the prize for the most patriotic address in the parish. Of the 19 terraced houses, all but two saw a total of 30 men leave for the front, with eleven of these never returning. The Sparks family moved to Platt from East Malling just after 1911 and settled at number 4. Thomas Sparks, an agricultural labourer, was born in Trottiscliffe (pronounced ‘Trosley’) and spent most of his pre-marital life living in Wrotham Heath. In 1889 he married Mary Ann Stannett from Wateringbury and settled nearby in Teston, where three of their nine children were born. The family were living at 4 Leigh Terrace in 1895 when the third son, named Arthur Victor Sparks joined the family, and by 1901 had moved to East Malling where they lived at Manor Farm and then afterwards ‘The Rocks’. Like many young men in the area, Arthur followed in his father’s footsteps and found employment as an agricultural labourer when he finished school. On 7 September 1914 Arthur visited the recruiting office in Maidstone with his friend Sydney Bowen (who lived next door at 5 Whatcote Cottages) and joined the East Kent Regiment. Both lads were posted to the 7th (Service) Battalion, The Buffs (East Kent Regiment) and sent for training in Purfleet. The battalion had been formed in Canterbury as part of the Second New Army (K2) and joined the 55th Brigade of the 18th Division. As part of K2, The Buffs were not immediately kitted out (K1 came first) and consequently the recruits began their training in civilian clothes, which not being designed for such rigorous activity, soon became ragged and torn. The remainder of 1914 was spent training and followed by a move to Colchester, and then Salisbury Plain in April 1915. On 27 July the battalion mobilised for war and entrained in Codford for Folkestone. Troop trains heading for the channel ports are known to have regularly passed through Platt, and it is possible Arthur and Sydney were able to glimpse one last look at the village before going overseas. At 10:10 pm on the 28th Arthur sailed on board the Golden Eagle and arrived in Boulogne shortly after midnight. His first taste of life in the trenches would have been during mid-August near Carnoy on the Somme when each of the battalion’s four companies were sent up to experience the firing line. The 55th Brigade held the line opposite the village of Fricourt, and as far as La Boiselle, for much of the remainder of 1915 and when they weren’t in the trenches were billeted at Dernancourt, which is about three miles south of Albert. A regimental history notes that the Germans in this particular sector were quite active in mining, and consequently the battalion War Diary makes regular mention of men being sent out on ‘mining fatigue’ which would have involved assisting the tunnellers digging towards the German lines and removing spoil from the shaft. At the end of February 1916, Arthur’s unit moved to St. Gratien, where they found themselves employed in constructing the Daours – Contay railway and by late March were occupying the trenches south of Maricourt, near the village of Suzanne. Arthur would have found life in this part of the line considerably more lively, with casualties from enemy shellfire being a frequent feature of the War Diary. By the end of May, The Buffs were at Picquigny and preparing for the ‘Big Push’ on the Somme. Dummy trenches were laid out on a replica of the area over which the battalion planned to attack, with a full ‘dress rehearsal’ even occurring at the start of June. 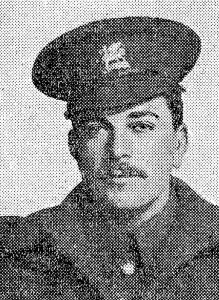 On 10 June the battalion began its journey towards the battlefield; however, Arthur was given a week’s leave and arrived back in Platt on the 13th. He rejoined his unit nine days later, while billeted at Bray, and remained there until the eve of the battle when Arthur and Sydney assembled with their respective platoons in the trenches at Lapree Wood. Hot tea and rum was prepared for the men to calm their nerves, and perhaps during the night, Arthur might have taken the opportunity to write home. Based on the information given in the War Diary, it seems probable that Arthur was serving with ‘A’ Company on 1 July 1916. The Buffs advanced at 7:30 am from the line in front of Carnoy towards their objective, which was a trench about two-hundred yards north of the Montauban-Fricourt road and tasked with clearing the Carnoy craters, which took six hours and saw some ferocious fighting. By the end of the day, the battalion suffered just over 200 casualties with a quarter of those killed in action. After the battle, Arthur’s unit retired to Bronfay Farm, where the troops were rested, cleaned up and reorganised. Both Platt men had come through the ‘first day’ unscathed, but would soon find themselves back in action at the Battle of Bazentin Ridge, with disastrous consequences for Arthur. The Buffs moved to Maricourt on 12 July and relieved the 20th Liverpool Regiment near Maltz Horn Farm, which was near Trônes Wood and held by the Germans. The following day the battalion received orders to advance through the southern half of the wood and capture a concrete bunker. In the attack, the men quickly discovered that the undergrowth contained a large number of German snipers, and following a period of furious hand-to-hand combat they were forced to withdraw. Four days later, while situated in the same trenches, The Buffs were ordered to clear the Germans from a position that lay perilously close to the British advanced line. The task was entrusted to two platoons from ‘A’ Company and required them to make a perilous assault over open ground. The attack failed with two casualties sustained, one of which was Arthur, who was seriously wounded about the face and head. He was evacuated to a Red Cross Hospital in Etaples but sadly died from his injuries. Arthur was buried in the Etaples Military Cemetery and awarded the 1915 Star, British War and Victory medals. His older brother William, a soldier in the Royal Horse Guards (Blue), had also been severely wounded in the early stages of the war but survived while another named Reginald also served on the Western Front.